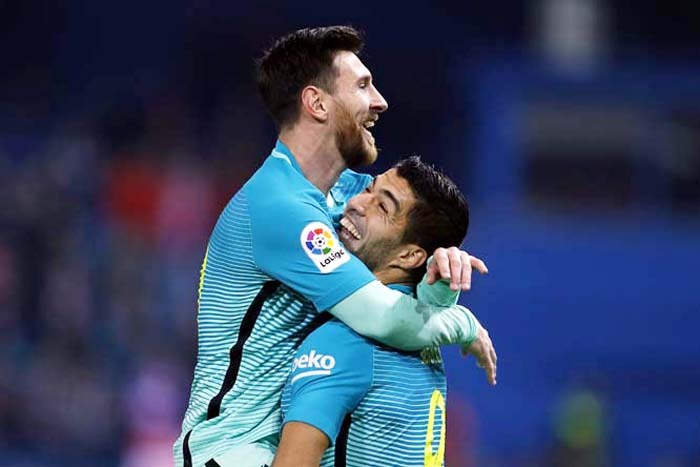 Wonder goals from Luis Suarez and Lionel Messi left Barcelona with a 2-1 Copa del Rey semi-final, first leg advantage over Atletico Madrid to take back to the Camp Nou next week. Suarez's solo effort and a thunderous strike from Messi gave Barca a deserved commanding lead at half-time. Yet, Atletico roared back after the break as Antoine Griezmann halved the arrears and the hosts went close to an equaliser as they piled on the pressure in the final stages. However, Diego Simeone's men were left to rue their slow start with Barca now favourites to make a fourth straight Cup final ahead of the second leg on February 7. "It is normal that playing here at their home they would push us and they were much better in the second-half than the first," said Suarez. "The didn't have anything to lose. They risked a lot more and made us suffer a little." The honours have been split two apiece in the four previous two-legged ties between these sides in the past three seasons. Yet there was a gulf in class as Barca took control in the first 45 minutes. It took just seven minutes for Suarez to open the scoring with his seventh goal in nine appearances against Atletico. The Uruguayan ran half the length of the field, leaving Diego Godin and Stefan Savic in his wake, before slotting the ball home with the outside of his foot into the far corner. Suarez should have had a second when he was played in by Neymar, but, inside of going for goal, the former Liverpool striker tried to return the ball to the Brazilian who couldn't control. Messi was the source of most of Barca's best moves and sealed a scintillating first-half performance with a stunning finish for the second 12 minutes before half-time when he blasted home off the inside of the post from outside the box. Atletico had offered precious little other than one effort from Koke that dipped onto the roof of the net before the break. However, the hosts were a team transformed after the break with Fernando Torres introduced alongside Griezmann up front. "We spoke at half-time and I think in the second-half we got close to the team we have always been," said Atletico boss Simeone. "I am left with that positive feeling. We were close to a draw, we fronted up against all the difficulties we faced in the first-half." Atletico were back in the tie just before the hour mark when a free-kick to the back post found Godin and his header across goal was turned home by Griezmann. The French international had a glorious chance to then level moments later when he was picked out perfectly by Filipe Luis's low cross. However, Griezmann's effort was straight at Jasper Cillessen, who saved from point blank range. Barca could have put the tie to bed with a third away goal as a Messi free-kick was brilliantly turned onto the bar by Miguel Angel Moya. Neymar then had a glorious chance as Messi again split the Atletico defence, but his careless finish flew miles over the bar with just Moya to beat. Barca could and arguably should have been punished in the latter stages as Torres flicked another fine Luis cross inches wide. Torres also fired wide with a much better opening from the edge of the area before Griezmann rifled a thirty-yard strike inches past Cillessen's far post.